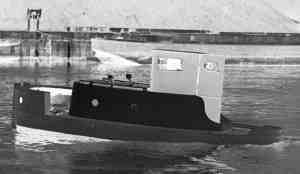 The Bantam class of tug was produced in the late 1940's and the 1950's and 1960's by E.C. Jones and Sons of Brentford. In 1994 London Canal Museum was given number 4 of the class which is preserved as a floating exhibit, normally moored outside the museum, but sometimes taken to canal events during the summer season. The Bantam tugs are unusual in that they are designed to push, not to tow. 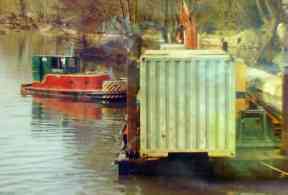 This is a more energy efficient way of moving an unpowered barge. The tugs were used most frequently for canal maintenance and in gravel pits and other non tidal waterway situations. The Bantam IV tug was completed in 1950 by E.C. 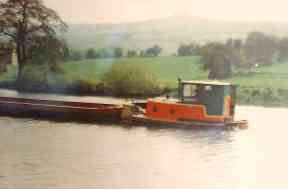 Jones, and spent much of its working life in gravel pits before being bought and restored for use as a working tug on the Kennet and Avon Canal. The distinctive livery dates from this period. 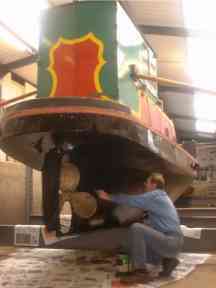 In 2000 the Canal Museum Trust undertook an overhaul and repaint of the tug including a spell in the dry dock at St. Pancras. The Lister JP2 diesel engine which is as originally fitted requires to be started by hand - a difficult process which requires a mixture of muscle and skill. 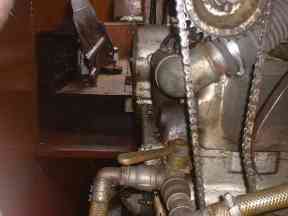 The engine is pictured below. 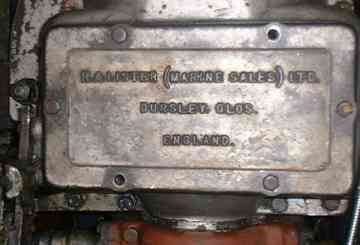 The maker's plate reads "R A Lister (Marine Sales) Ltd. Dursley, Glos, England"
You can listen to two sound files to hear the engine. They are large files in WAV format so will take some time to download especially if you have a slower connection. Please be patient! 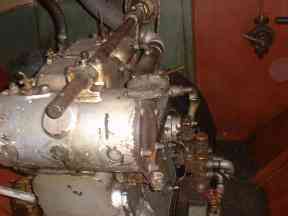 The Lister JP2 Engine is the original and is still in working order. At work in its days on the Kennet and Avon Canal. The picture on the right shows the tug propelling a flat barge. Because there is nothing immediately behind, this method offers a fuel saving compared to towing from the front. In the dry dock at St. Pancras for maintenance. The Bantam Tug List- details of all the Bantam tugs.